17 December 2014: This spectacular image of the star cluster Messier 47 was taken using the Wide Field Imager camera, installed on the MPG/ESO 2.2-metre telescope at ESO’s La Silla Observatory in Chile. 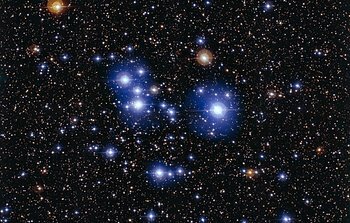 This young open cluster is dominated by a sprinkling of brilliant blue stars but also contains a few contrasting red giant stars. 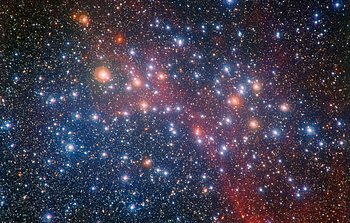 26 November 2014: The MPG/ESO 2.2-metre telescope at ESO’s La Silla Observatory in Chile has captured a richly colourful view of the bright star cluster NGC 3532. Some of the stars still shine with a hot bluish colour, but many of the more massive ones have become red giants and glow with a rich orange hue. 19 November 2014: New observations with ESO’s Very Large Telescope (VLT) in Chile have revealed alignments over the largest structures ever discovered in the Universe. A European research team has found that the rotation axes of the central supermassive black holes in a sample of quasars are parallel to each other over distances of billions of light-years. 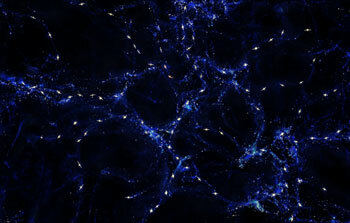 The team has also found that the rotation axes of these quasars tend to be aligned with the vast structures in the cosmic web in which they reside. 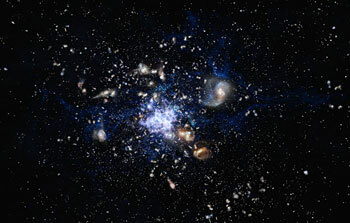 10 November 2014: The new MUSE instrument on ESO’s Very Large Telescope (VLT) has provided researchers with the best view yet of a spectacular cosmic crash. 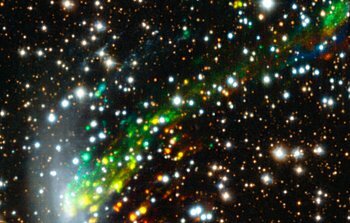 The new observations reveal for the first time the motion of gas as it is ripped out of the galaxy ESO 137-001 as it ploughs at high speed into a vast galaxy cluster. 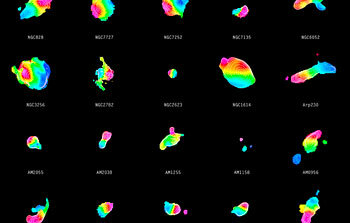 The results are the key to the solution of a long-standing mystery — why star formation switches off in galaxy clusters. 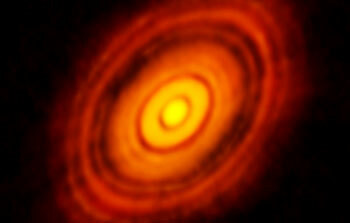 6 November 2014: This new image from ALMA, the Atacama Large Millimeter/submillimeter Array, reveals extraordinarily fine detail that has never been seen before in the planet-forming disc around a young star. These are the first observations that have used ALMA in its near-final configuration and the sharpest pictures ever made at submillimetre wavelengths. The new results are an enormous step forward in the observation of how protoplanetary discs develop and how planets form. 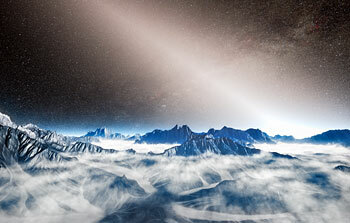 3 November 2014: By using the full power of the Very Large Telescope Interferometer an international team of astronomers has discovered exozodiacal light close to the habitable zones around nine nearby stars. 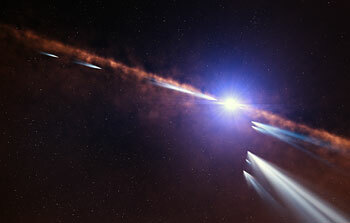 This light is starlight reflected from dust created as the result of collisions between asteroids, and the evaporation of comets. The presence of such large amounts of dust in the inner regions around some stars may pose an obstacle to the direct imaging of Earth-like planets in the future. 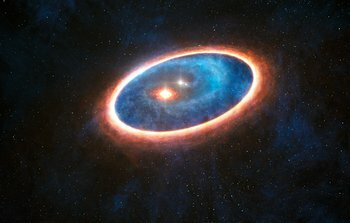 29 October 2014: For the first time, researchers using ALMA have detected a streamer of gas flowing from a massive outer disc toward the inner reaches of a binary star system. This never-before-seen feature may be responsible for sustaining a second, smaller disc of planet-forming material that otherwise would have disappeared long ago. Half of Sun-like stars are born in binary systems, meaning that these findings will have major consequences for the hunt for exoplanets. The results are published in the journal Nature on 30 October 2014. 28 October 2014: Today Professor Lena Kolarska-Bobińska, the Polish Minister of Science and Higher Education, signed an agreement that will lead to the country joining the European Southern Observatory (ESO) — the world’s most productive ground-based observatory. ESO is looking forward to welcoming Poland as a Member State, following subsequent ratification of the accession agreement. 15 October 2014: Astronomers have used the APEX telescope to probe a huge galaxy cluster that is forming in the early Universe and revealed that much of the star formation taking place is not only hidden by dust, but also occurring in unexpected places. 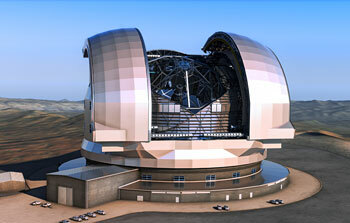 This is the first time that a full census of the star formation in such an object has been possible. 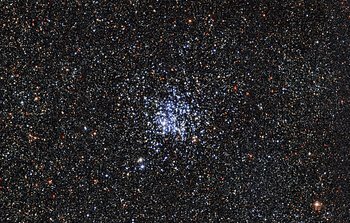 1 October 2014: The Wide Field Imager on the MPG/ESO 2.2-metre telescope at ESO’s La Silla Observatory in Chile has taken this beautiful image, dappled with blue stars, of one of the most star-rich open clusters currently known — Messier 11, also known as NGC 6705 or the Wild Duck Cluster. 17 September 2014: For decades scientists have believed that galaxy mergers usually result in the formation of elliptical galaxies. 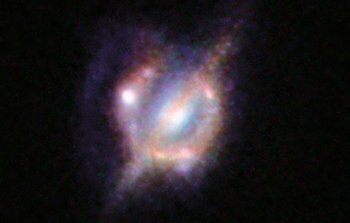 Now, for the the first time, researchers using ALMA and a host of other radio telescopes have found direct evidence that merging galaxies can instead form disc galaxies, and that this outcome is in fact quite common. This surprising result could explain why there are so many spiral galaxies like the Milky Way in the Universe. 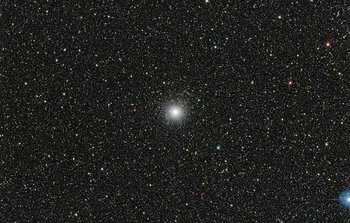 10 September 2014: This new image from the VLT Survey Telescope at ESO’s Paranal Observatory in northern Chile shows a vast collection of stars, the globular cluster Messier 54. This cluster looks very similar to many others but it has a secret. Messier 54 doesn’t belong to the Milky Way, but is part of a small satellite galaxy, the Sagittarius Dwarf Galaxy. This unusual parentage has now allowed astronomers to use the Very Large Telescope (VLT) to test whether there are also unexpectedly low levels of the element lithium in stars outside the Milky Way. 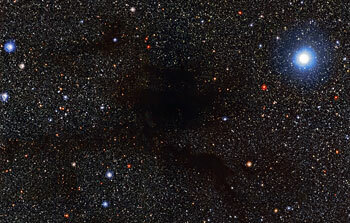 3 September 2014: Lupus 4, a spider-shaped blob of gas and dust, blots out background stars like a dark cloud on a moonless night in this intriguing new image. Although gloomy for now, dense pockets of material within clouds such as Lupus 4 are where new stars form and where they will later burst into radiant life. The Wide Field Imager on the MPG/ESO 2.2-metre telescope at ESO’s La Silla Observatory in Chile captured this new picture. 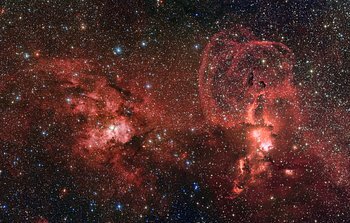 20 August 2014: This image, captured by the Wide Field Imager at ESO’s La Silla Observatory in Chile, shows two dramatic star formation regions in the southern Milky Way. The first is of these, on the left, is dominated by the star cluster NGC 3603, located 20 000 light-years away, in the Carina–Sagittarius spiral arm of the Milky Way galaxy. The second object, on the right, is a collection of glowing gas clouds known as NGC 3576 that lies only about half as far from Earth. 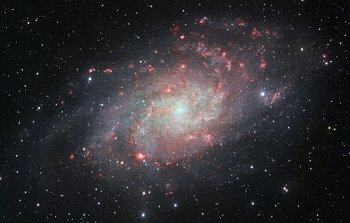 6 August 2014: The VLT Survey Telescope (VST) at ESO’s Paranal Observatory in Chile has captured a beautifully detailed image of the galaxy Messier 33. This nearby spiral, the second closest large galaxy to our own galaxy, the Milky Way, is packed with bright star clusters, and clouds of gas and dust. The new picture is amongst the most detailed wide-field views of this object ever taken and shows the many glowing red gas clouds in the spiral arms with particular clarity. 30 July 2014: Astronomers using the Atacama Large Millimeter/submillimeter Array (ALMA) have found wildly misaligned planet-forming gas discs around the two young stars in the binary system HK Tauri. 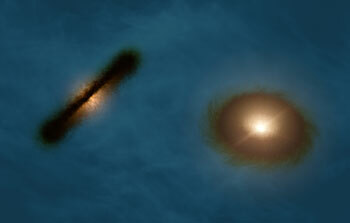 These new ALMA observations provide the clearest picture ever of protoplanetary discs in a double star. The new result also helps to explain why so many exoplanets — unlike the planets in the Solar System — came to have strange, eccentric or inclined orbits. The results will appear in the journal Nature on 31 July 2014. 23 July 2014: In this striking new image from ESO’s La Silla Observatory in Chile young stars huddle together against a backdrop of clouds of glowing gas and lanes of dust. 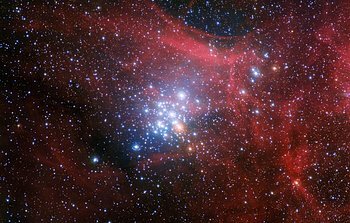 The star cluster, known as NGC 3293, would have been just a cloud of gas and dust itself about ten million years ago, but as stars began to form it became the bright group of stars we see here. Clusters like this are celestial laboratories that allow astronomers to learn more about how stars evolve.